I’d written two screenplays for feature films, but could find no takers for them. So I wrote a novel. And could find neither representation nor a publisher. I wrote a lot of short stories. I managed to place a few, but nowhere particularly prestigious. Given how much time and energy I was committing to writing, it was easy to start getting frustrated. I very keenly felt the power differential between those who produced, and those who represented or published. I felt that I was forever going, “cap in hand,” in front of someone else looking for validation. I knew from my artist friends that they all felt the same way, and were frustrated themselves because there seemed to be a limited number of “gatekeepers” or “tastemakers” who decided what was good enough. A lot of interesting work was getting shut out because it was not fashionable. 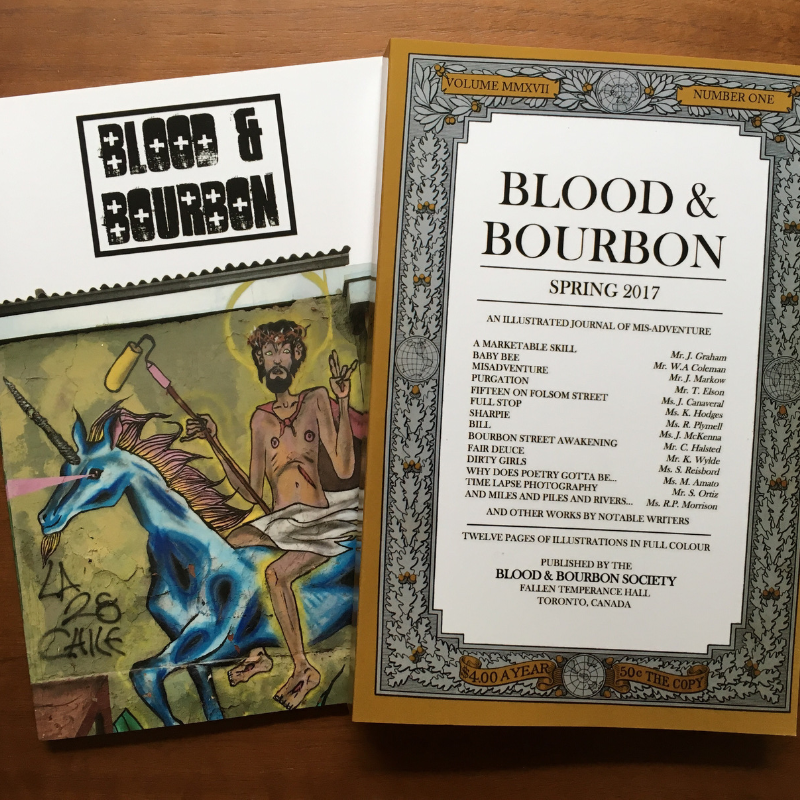 And so, a friend and I decided to do something about it, and we started a literary magazine called “Blood & Bourbon.” It was never meant to be a money maker, but was a means for us to give a leg up to all the writers whose work we enjoyed and wanted to see in print. We wrote a manifesto (you can read it here) and set out to right publishing wrongs. In a sense, this project was putting karma in the bank for us. We covered the costs out of pocket, and just focused on doing right by the writers (and photographers) whose work we had the privilege to feature. We had no motives other than that. Amazing things started to happen. First off, we met a whole new group of great writers and artists, some local and others spread around the world, whose work we enjoyed. We built a community of people around ourselves, some of whom became good friends. We’ve built out the Blood & Bourbon team to include some awesome editors (much love to Raya, Lisa and Andrea), and are poised to grow again with this edition. And, some of that banked karma began to pay off. I optioned a screenplay, and signed a traditional publishing deal. More opportunities started to flow my way, and it all came about through people helping other people. We’re about to publish the fifth edition in the coming month, and we’re not looking back. Helping others is the best way to find help for yourself.